Remember when you first started playing competitive tennis? In the beginning you weren’t very skilled and there were plenty of other players better than you. But that didn’t bother you… every match you played, you fought tooth and nail to win each point. The challenges of the game were exciting and you enjoyed the game of tennis. Then something changed… the thrill of facing challenges was replaced by the need to win. The pressure to win zapped your zest for the game. Instead of enjoying the fight for each point, you feared losing. The threat of losing lessened your enthusiasm and your motivation. You lost your love for the game… You lost that sense of excitement that comes with overcoming the unique struggles of each match. 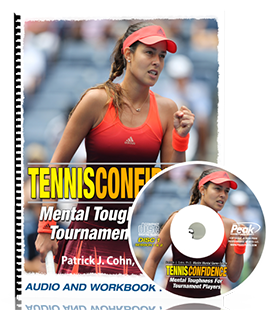 There are two mindsets a tennis player can choose heading into each match. You will be motivated to go for it in tennis matches. You feel psyched to compete, yet relaxed while playing. You will be willing to put it all on the line and go for shots. You will not become distraught by mistakes. You will feel confident in your abilities to overcome obstacles. You will be better equipped to focus on what you need to do in the moment. You will have fun playing the game of tennis. Martina Hingis has a renewed enthusiasm for the challenges of game. Hingis had an interesting singles career. Hingis turned professional at the age of 14, won five Grand Slam titles, spent 209 weeks ranked #1 in the world and was inducted into the International Tennis Hall of Fame in 2013. Despite her accolades, Hingis has had her share of adversity retiring twice from Singles competition for significant periods of time in 2003 and 2010 due to injuries and personal issues. In 2015, Hingis returned to tennis but, this time, as a doubles player. This time around, Hingis is committed to enjoy the fight and the challenges of the game. Hingis’ mindset has paid off tremendously. Hingis and her doubles partner Sania Mirzaand have won their first three doubles tournaments together: the 2015 BNP Paribas Open, the 2015 Miami Open and the 2015 Family Circle Cup. The key to the success of Hingis and Mirzaand is their mindset. Tip #1: Control your mindset. Do you fear losing or are you excited about the challenges of tennis? 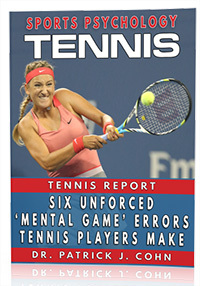 Is your mindset helping or hurting your tennis performance? Tip #2: See the challenges in the game. Consistently look for the challenges in front of view and quickly determine your strategy to overcome.